Available for various e-readers, MP3 audio, CD, Audible, etc. From the publisher: After decades of service and years of watching her family’s troubles splashed across the tabloids, Britain’s Queen is beginning to feel her age. She needs some proper cheering up. An unexpected opportunity offers her relief: an impromptu visit to a place that holds happy memories—the former royal yacht, Britannia, now moored near Edinburgh. Hidden beneath a skull-emblazoned hoodie, the limber Elizabeth (thank goodness for yoga) walks out of Buckingham Palace into the freedom of a rainy London day and heads for King’s Cross to catch a train to Scotland. But a characterful cast of royal attendants has discovered her missing. In uneasy alliance a lady-in-waiting, a butler, an equerry, a girl from the stables, a dresser, and a clerk from the shop that supplies Her Majesty’s cheese set out to find her and bring her back before her absence becomes a national scandal. 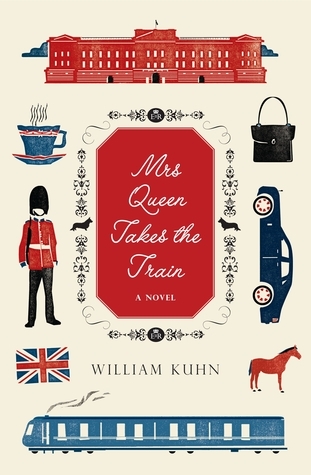 MRS QUEEN TAKES THE TRAIN offers a fresh new look at a seemingly arcane institution and a woman who wonders if she, too, has become a relic of the past. It's about British social, political, and generational rivalries—between upstairs and downstairs, the monarchy and the government, the old and the young. The story tweaks the pomp of the British monarchy, going beneath its rigid formality to reveal the human heart of the woman at its center. My thoughts: Anyone who has spent any time here on my blog knows that I am pretty much a "sucker" for anything British. I'm an Anglophile. There, I said it. Sign me up for Anglophiles Anonymous. So, was predisposed to LOVE this book. I have a great admiration for HRH Queen Elizabeth and of her unfailing service to her country and its people. I really wanted to LOVE this book. I liked parts of it, but I didn't love it. Blimey, that makes me sad. Mrs. Queen Takes the Train is the first novel by author and historian William Kuhn, his background in writing has a British slant and I was excited to be able to read the book. I dived in and then...stopped. The book opened with a really believable "back story" explaining where the Queen's nickname "Lilibet" came from, that it was actually a child's version of "a little bit." Seems the Nanny had told the very young Princess Elizabeth that she could only have "a little bit" of cake, and the child repeated what she heard "lilibet." And there was her nickname. Cute! Really true? Who knows. Imagining the Queen struggling with Twitter, FaceBook and realizing that people would impersonate someone from the royal family online was something she wasn't used to seeing! Pretending to be her daughter-in-law, announcing that it was "gin o'clock" was something she couldn't believe. Great stuff so far, I thought. About three fourths of my way into the book, I reached the point where I disconnected. I walked away from this book for a few months, but I did go back and finish it. I was very intrigued by the plot line description, and loved the interactions with of people within her staff.. I could see HRH out in the rain, putting on the slicker offered by young Rebecca, one of the staff who looks after the Royal horses. I loved the idea of The Queen wandering around London in a slicker with a skull on the back and a package of cigarettes and a knife in the pocket. You see the Queen was getting a bit restless, and she missed being able to get away on the now de-commissioned royal yacht. What better way than to just take yourself out on the street and maybe find the Britannia?! She then encounters Rajiv, an employee at a cheese shop and I just prayed that he wasn't going to be a major character. But since we'd already had back story on him, I knew he was a major player. Problem being, I didn't like him or trust him. However, I rather enjoyed the bickering between the Queen's palace staff, including Shirley, one of the Queen's dressers Lady Anne Bevil, Lady-in-waiting, companion and somewhat of a secretary to the Queen. Then she finally gets to the train, with staffers of all kinds trailing a distance behind her, and it's right past this point where I gave up. I know that the secondary characters need to provide background and offer other story lines and complications, but you see, I didn't care about them, I didn't want or need to know so much about lives of the gay staff members and how many gay versus straight people there were on staff. I wasn't expecting so much in the way of an agenda woven into what I thought was going to be an adventure with the Queen "on the lam" so to speak, as she escapes her world for a while, and in turn, we will escape ours and join her for a fun day's adventure. After finishing the book, I can say that at the root, Mr. Kuhn told a great story, and his knowledge of things "royal" was clear to see as the story unfolded and the Queen's ride in search of the Brittania took place. However, it just wasn't the ride I was expecting. So, to be fair to Mr. Kuhn, I will give it 3 1/2 out of 5 stars as it's not his fault I expected something else.